When Doug challenged me several weeks ago to come up with a recipe that included his choice of random ingredients (ala the Food Network show "Chopped"), I readily agreed. When he told me the ingredients were Bell Peppers, Sharp Cheddar Cheese and Oatmeal.. I gagged slightly. This would be a challenge. At first I thought about doing a quiche with an oatmeal crust. However after hanging out with my Hungarian dad, I settled on something more familiar. Stuffed bell peppers! This recipe makes two halves, which I am counting as two servings. You can lower the calories by using reduced fat cheese or a leaner ground meat. These freeze and reheat well. Enjoy and I look forward to seeing who wins the $10 Starbucks gift card! The March challenge closes at midnight on the 31st! Set aside a pinch or two of cheese. Mix remaining ingredients, except bell pepper and tomato sauce, together until blended. Stuff into two halves of the pepper and bake for 20 minutes. Open the can of sauce and pour over peppers. Bake for 20 more minutes. Sprinkle remaining cheese on top. Bake for 5 more minutes. This should be enough time to cook through while not leaving the bell pepper soggy. You can check the internal temperature of the meat with a thermometer. Stuffed peppers was definitely the right way to go with these ingredients. Oatmeal is the hard one here but it sounds like it was pretty good with the pepper. Good luck! 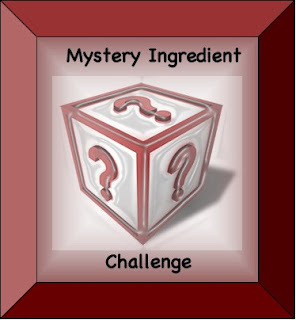 A great job turning those mystery ingredients into a lovely dish. You'd get my vote if I were a judge on "Iron Chef'' or "Chopped''! That looks great, what a creative way to use those ingredients! this was the perfet idea for these ingredients!! I finally came up with some ideas for this... I'm on call all weekend, but hopefully I'll have time to try somrthing out.